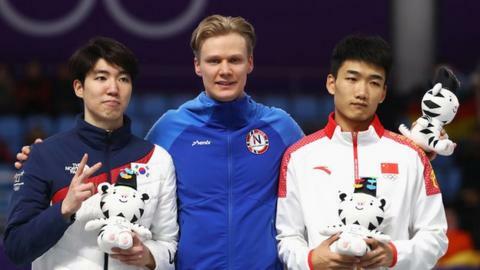 Norway's Havard Lorentzen set a Winter Olympic record to win the men's 500m speed skating final by 0.01 seconds. This season's World Cup leader edged out South Korea's Cha Min-kyu after clocking 34.41 seconds at Gangneung Oval. Gao Tingyu finished third for China, 0.24 seconds behind Lorentzen. It is the first time in 70 years that Norway have claimed the title after Finn Helgesen's gold medal in 1948. Norway have now won 27 medals in Pyeongchang, setting a new record for their most at a single Winter Olympics, having achieved 26 in both 1994 and 2014. The event follows a time trial format, with the 32 qualifiers taking it in turn to race in pairs in separate lanes on a 400m oval track. Japan's Tsubasa Hasegawa, skating in the first pair of 18 pairs, set the early mark of 35.08 seconds. It took until the 10th pair for world champion and Sochi 2014 silver medallist Jan Smeekens from the Netherland's to move ahead with 34.930 seconds. Smeekens was soon relegated to third as Gao - with a track record - and Japan's Jojo Kato moved ahead. South Korea's Cha then delighted the home crowd with an Olympic record with four pairs remaining. But Lorentzen made up for a slower 100m split to move to the top of the timesheets. Sochi bronze medallist Ronald Mulder, who was skating alongside Lorentzen, was unable to make an impact for the Netherlands and finished seventh.